Vegan sandwiches, oh no you didn’t! (oh yes I did). I have been getting a lot of emails lately from super nice people trying to figure out how to go vegan. That’s something I want to help with! I don’t usually need to help people with the why, I mean it’s pretty clear to us all, right? Animal cruelty, health, environmental, whatever your reason, there are many, many whys. The hows on the other hand, are not as obvious. At least not yet! It’s all about replacing old habits with new ones. One question that keeps reoccurring was “what do I bring for lunch?” Soups, salads, and sandwiches, baby! Just because you’re eating vegan doesn’t mean you have to go way out of your comfort zone. So I designed these 5 Vegan Sandwiches (one for every day of the work or school week), to be delicious, easy, and familiar! 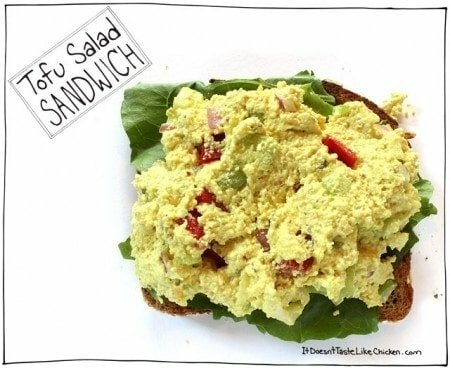 The Chickpea Salad Sandwich, Cashew Ricotta, Tofu Salad Sandwich fillings and the Tofu or Tempeh Bacon, can all be made in advance and stored in an airtight container in the fridge. If you really like one sandwich, make a big batch and eat it all week long! I love all of these sandwiches but am pretty much obsessed with chickpeas so I eat the Chickpea Salad ALL THE TIME. Go ahead, I dare you not to like it! This sandwich is just like a chicken or tuna salad sandwich but instead, chickpeas are used. It's so yummy and satisfying! 8 slices bread or toast, or 4 tortillas. Add the chickpeas to a food processor along with the vegan mayonnaise, dijon mustard, capers, salt and pepper. Pulse stopping to scrape the sides, until the mixture is mashed but still has texture. Add in the celery and red onion and pulse to incorporate. 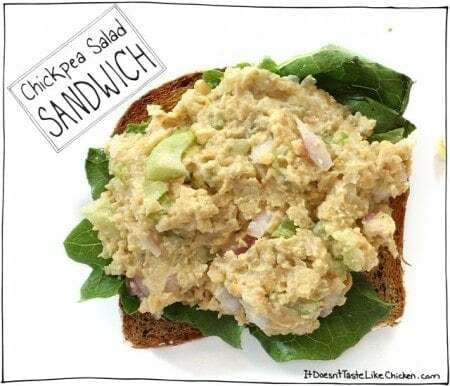 Spread the chickpea salad on bread or in a wrap and top with your favourite veggies. 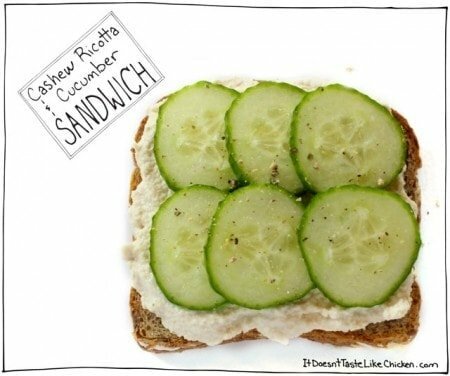 This simple sandwich is great served open face or as a classic cucumber tea sandwich. Spread the bread or wrap with a thick, delicious layer of Cashew Ricotta, top with cucumber slices and a grind of pepper. 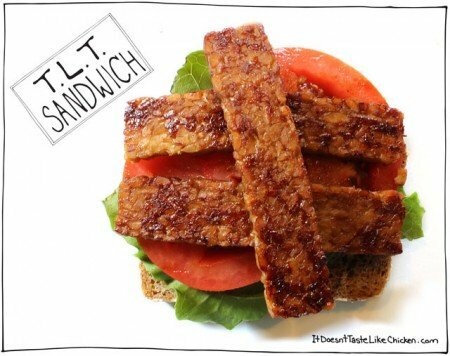 Tempeh Lettuce and Tomato Sandwich! Mix all the tempeh marinade ingredients together in a flat shallow dish or resealable bag. Add the tempeh and lightly toss to coat. Let marinate for a minimum of 10 minutes or as long as a few days when kept covered in the fridge. Heat olive oil in a pan and fry the tempeh for about 8 minutes per side or until browned and crispy. As the strips cook keep spooning the leftover marinade on top until you run out. The marinade will turn into a sticky glaze that will taste extra amazing! To assemble the sandwich, spread a slice of bread or tortilla with vegan mayonnaise, top with lettuce, tomato and the tempeh. This sandwich is just like an egg salad sandwich but instead of egg, tofu is used. It's every bit as creamy and delicious! Add the tofu, mayonnaise, mustard, capers, salt, turmeric, and pepper to a food processor. Blend stopping to scrape the sides as needed until the tofu is broken down, but still contains a bit of texture. Add in the celery, red pepper, and red onion and pulse to incorporate. Spread the tofu salad on bread or toast and top with veggies as desired. Black salt (also called kala namak) is a salt that tastes just like eggs. It's actually pink in colour, but don't confuse it with Himalayan salt which is different. Use it anywhere you want an egg-y taste. It can be found in Indian grocery stores or online. This often over looked sandwich is so comforting and classic, or you can get your fancy pants and jazz it up with different nut butters, and all sorts of nice jellies. Spread the peanut butter on the bread. Top with the jelly and then the final layer of bread. Feature Ingredients: Chickpeas, Cucumbers, and Tempeh. 280 Days 87 Recipes to go! I tried the TLT Sandwich from your book, perfect! I love BLTs or BLATs, love maple bacon, but I wanted a non meat healthier choice, that does’t leave me missing bacon. Or running back to bacon. I dont like tempeh so I marinated tofu strips, oh my God, really just fantastic!! Smokey, sweet, perfection! I’ll be eating another one tomorrow for lunch with leftovers!! I just prepared the chickpea salad (from your gorgeous book!) and popped it in the fridge for dinner later, at first taste it was AMAZING and tasted like a really good tuna salad!!! When is dinner? I can’t wait! Based on what was in my fridge, I used black olives instead of capers, cucumber instead of celery & threw in some slices of pickled cucumbers. Yummy! P.S. The mayonnaise recipe in your book is incredible, too!! Thanks so much! And no salmonella worries, yeah! Safe & delicious summer picknicks, here we come :). I’ve really been enjoying your blog and YouTuJbe channel. I love your personality. Just curious, could I use vegan yogurt instead of mayo? I don’t have any. Thank you so much, Maxwell! Yes, vegan yogurt should work well. Enjoy! Thank you so much Sam. I love your blog and personality. I was thinking about buying your cookbook. What kind of special recipes are in it? What are your featured recipes? The TLT is to die for. I have a love hate relationship with tempeh so I’m always trying to find recipes that can mask its sometimes funky taste. This one does the trick! I love your blog. Every recipe I’ve tried is gold! I’m going to have to get your cookbook! The chickpea salad is phenomenal. I am still new to vegan diet and this is a WIN! Reminds me of egg salad or tuna but so MUCH BETTER! My new lunchtime favorite. Quick, easy to add different veggies, and cheap!!! I’m new to eating vegan and just tried the Chickpea Salad recipe – it was DELICIOUS! I can’t get enough of it! I used scallions instead of red onion because it’s what I had. I’m so happy to find something I can bring with me to work. Can’t wait to try the rest of the sandwiches! Thanks!! I’m a new vegan, just started this week, and I’ve been driving myself crazy about what to put in my daughters lunch for school. This should be very helpful! I’m pinning your site so I can try all your other recipes too! Thanks for all your hard work! 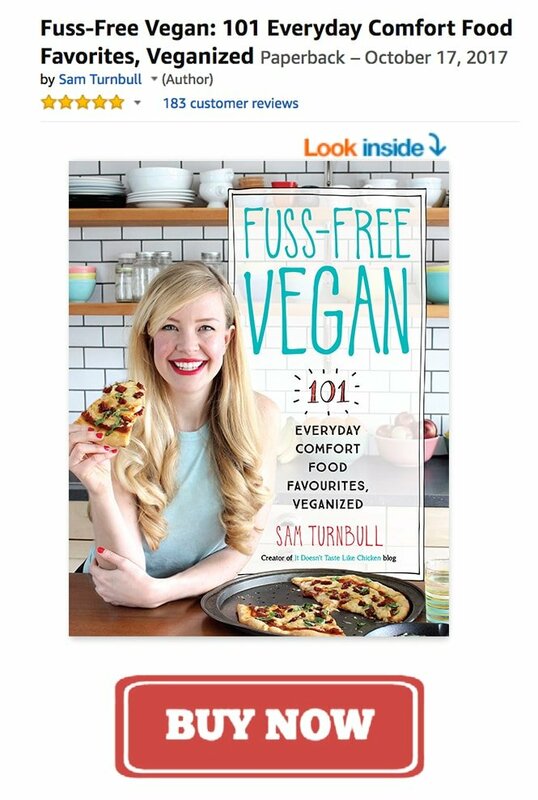 Hi Sam, I’m also a newly converted Vegan and I was wondering if you could tell me what bread to use? I’m in Australia so not sure if we have access to the same products here? The Chickpea Salad Sandwich spread when packed for lunch becomes soggy without butter. There is a super easy recipe for vegan butter, but I want to omit added oils from my diet for health reasons. The recipe is yummy, but soggy sandwiches are not a great thing when you open your lunch box at work. Any fat free ideas. Or I guess, since nut butters are whole foods, will that be a healthier option? Have A Great Weekend. Yes, I think that would be a better idea. I love eating it plain too. I’m so excited to try tempeh! Your T.L.T looks scrumptious! I just made the Chick-Pea Salad and I just couldn’t believe it. It is SO good. I added the lemon juice as one reviewer suggested. Not sure exactly what it tastes like – tuna salad? – but it doesn’t matter. The point is, it is just delicious. Even served it to a non-vegan yesterday and she loved it but couldn’t guess what it was. Wonder if it would taste like egg salad if you added black salt – I’ll have to try it. Going to try the tempeh bacon next. Home grown tomatoes are at the farmer’s market and i am so craving a TLT! Another 5 star hit Sam! (It still won’t let me select the stars). Since God VERY CLEARLY states in His word–you know, the Bible?–that He gave animals to man for food as well as for work, I have no qualms at all about eating meat, other than pig meat and bottom scavengers of the oceans. I’m not religious, but I am pretty sure the bible also says “Thou shalt not kill”. I don’t think there is any subtext that says unless it has four legs, or fur, or fins, or wings… Here are some other quote from the bible that might interest you. I also suggest watching Earthlings. I have just come across your comment and i am stunned by it. Of course everyone is entitled to their religious views, however as Sam said the Bible clearly says ‘thou shalt not kill.’ We as humans are animals ourselves, and to say that animals were put here for our consumption alone is entirely incorrect. People don’t think twice about eating a cow or fish or a chicken, but would be appalled if someone were to say eat a dog? I do not understand this logic for the life of me. All life is sacred and all living things including us as well as animals have feelings and pain receptors and it is SO wrong to put animals through the torture that they go through just to let us have say a sausage at the dinner table. Educate yourself. Thanks for your support Tierra. Yeah, I don’t understand why people comment this kind of thing either, especially on a sandwich recipe! That’s why I just try to do my best to inform them. You’re absolutely right, the environment is another great reason. I’m sure you have seen it but for those who haven’t, I highly recommend the documentaryCowspiracy which looks at the environmental impacts of animal agriculture. Do you know about internet trolls? Veganism is always attacked by internet trolls. I can’t believe Joyce has the nerve to push her religious carnivorous ideas here on a vegan blog and recipe site. Pull your head in Joyce and keep your comments to yourself or make them somewhere else, not here. Your views are not welcome, to this reader at least. For the vegan bacon, can I sub maple syrup with honey and maple extract. I don’t cook with honey as it isn’t actually vegan, so I am not sure, but I don’t see why it wouldn’t work. *the mod was to the chickpea salad sandwich. Just wanted to share a modification I made that took this already amazing recipe to a whole new level: I added 2-3 Tbs of lemon juice. Wow! It sweetened it up and made the mixture stick together even better! Thanks for this recipe! I make it all the time! if you freeze tofu before cutting into chunks for ‘chicken salad’, it will take on a more ‘chicken’ texture and makes for a better salad mixture. Hi…I am 3 months into a nutritarian diet, and am learning many new ways to cook with nuts, especially sauces, dips and salad dressings. BUT, I live in Costa Rica, so it is not possible for me to get miso paste and nutritional yeast. These seem to appear over and over again in sauce-type recipes, so I don’t know what to do. Any good alternatives? Happy 3 months! Both nutritional yeast and miso paste can be ordered online but I am not sure if that can be found with delivery to Costa Rica. You might want to search online and see if you can find some place. Otherwise, both nutritional yeast and miso paste are used for flavour in most recipes. So you can either skip it, and boost up some of the other flavours, or you can try substituting it. For nutritional yeast, you can try substituting powdered cashews or pine nuts, or perhaps a small amount of vegetable bullion powder. For miso paste you could try marmite, a mix of soy sauce and tomato paste, or tahini and soy sauce. I hope that helps! The tempeh blt is a must! Don’t let it scare you, tempeh is super easy to make, not to mention the texture will have you wondering why you bothered with bacon for so long. Thanks for another fantastic recipe! You’re very welcome! Yes, I love me some T.L.T’s!! Yum! I made the chickpea salad sandwich this morning. It tastes exactly like a tuna fish salad sandwich. YUM! Thank you Beth, and thank you for sharing! Now that is a huge success story!! I love it! Thank you for sharing Jen. That totally made my day. I love this ricotta too. I also use it in this pasta bake recipe: https://itdoesnttastelikechicken.com/2014/08/20/kale-cashew-ricotta-pasta-bake/ I even make it gluten free by using brown rice pasta (my favourite). So glad you had such a roaring success! I am loving these recipes. I am new to the vegan world although I was only a short distance away but I am so looking forward to trying your recipes. Anything that will help get me past my bacon craving is a good thing. Ahaha, I hope you have gotten my free ebook of 5 Vegan Bacon Recipes then! Link here: https://itdoesnttastelikechicken.com/subscribe/ I like to keep in mind what the flavour of bacon really are, and that is fat, salt, and smoke. So if you use that combination on other foods you just might be surprised at how satisfying they are! Out of curiosity, do you think I could swap out the vegenaise for mashed avocado? I have pretty much all of the ingredients for the chickpea salad (it sounds so incredibly delicious) and don’t really feel like running to the store heh. Haha! For future, I think the mashed avocado would taste fine, but it would probably make the chickpeas a funny slimy green colour! Just wanted to comment to say that I tried the tofu salad sandwich, and my meat loving husband absolutely can’t get enough of it! He kept dipping his finger into the bowl to get more out. It’s amazing. Hahaha! That’s perfect!! Thank you for sharing that, it totally made my day. I love being all sneaky and feeding meat eaters vegan food that they fall in love with. I hope he demands tofu all the time now. Hey, i am interesteed in becoming more vegan- im currently not vegan or vegetarian but im curious! i have my reasons like you mentioned above. these look good, can you make them all the night before and store in the fridge? or can you make favourites in a batch and fridge them all week? so like if i make lots of the same sandwich in one go will they last all week in the fridge? New Vegan…longtime wanna be vegan. Want no more! It’s really easy to be vegan. All it takes is replacing a few old habits with a few new ones. In time you won’t even really think about it much… unless you are food obsessed like me! haha! I have a house full of males. My husband and then my boys ages 11, 16 and 18. They fight me all the time on this. I end up giving up. Any advice on how to convert? Their worst is the sandwich and breakfast meat and the cheese. Yay! This is so brilliant. I always have SUCH a hard time trying to come up with lunch ideas, so I’m definitely pinning these! 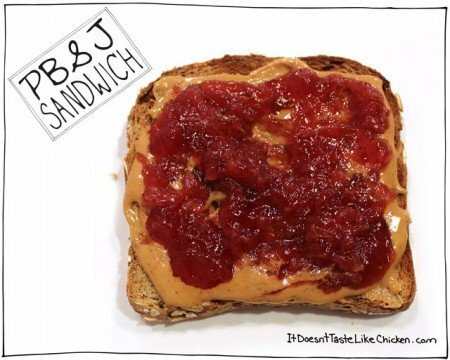 PB & J sandwich = Brilliant…. I LOVE IT! Thanks for pinning 🙂 I love me some lunch! I just made chickpea salad last night! Definitely one of my favorites. It’s delicious and so easy to put together! That TLT looks ah-maaaaazing. Ugh. I wish I had it for breakfast right now! Ohmygawd. I love chickpeas. When I pop open a can I end up eating about 1/4 of the can just while I am preparing other stuff. Seriously, it’s a problem. Luckily for you Meredith, Sunday is coming soon, perfect day for a nice TLT for breakie! Oh, I love me a good sammich! These look delicious. I HAVE to try the ricotta and bacon – have the tempeh in the fridge just for the occasion. Pectin is Vegan! Good to know. Thanks.